Beautiful day (but cold!) in Charlestown today for the Holiday Stroll! Santa brought out families from the neighborhood, and it was great to see so many friends of Vivi and I. I love that I was able to build such an amazing network of friends and am so grateful for our close neighborhood. It was a nice end to the 2018 craft show season. Until next year! I will be participating in the Charlestown Holiday Stroll tomorrow in the training field (right on the Freedom Trail) from 10-2. I’ll be bundled up, so please stop by and say “hi”! I really appreciated all of the family support at the Tedesco Holiday Show this year! It was so nice to catch up before the holidays. I can’t believe this was my last show of the season. The fall just flew on by! Time to get back to work and stock up for next year! I’m glad that I was able to participate in this show as a first-timer. It was only a 10 minute drive from my home and conveniently fell on small business Saturday. While there was free admission, the foot traffic was a little bit lighter than I would have expected. I think parking was a factor for customers, so hopefully there can be solutions for next year! It was my first time at Temple Emmanuel, and I had such a nice time! The women I met were so kind and appreciative of my work. There were a lot of gifts purchased for the upcoming holidays, which made me reconsider my bag size for customers with multiple purchases. Great lesson to learn! I had a great time at the Needham show over the weekend! I have done this show for a few years, so it is nice to see past customers, especially when they are wearing one of my scarves. The new location at the middle school worked out well, but I think it will be great to be back at the high school for next year as most of the customers are familiar with that location. Below are some of my Red Sox favorites from the show, Goooooo Sox! First show of the 2018 season! Rose is ready to go! With a Robin egg blue scarf. Last show of the 2017 season! I had a great time at the Salem Holiday Market sponsored by New England Open Markets on Sunday. 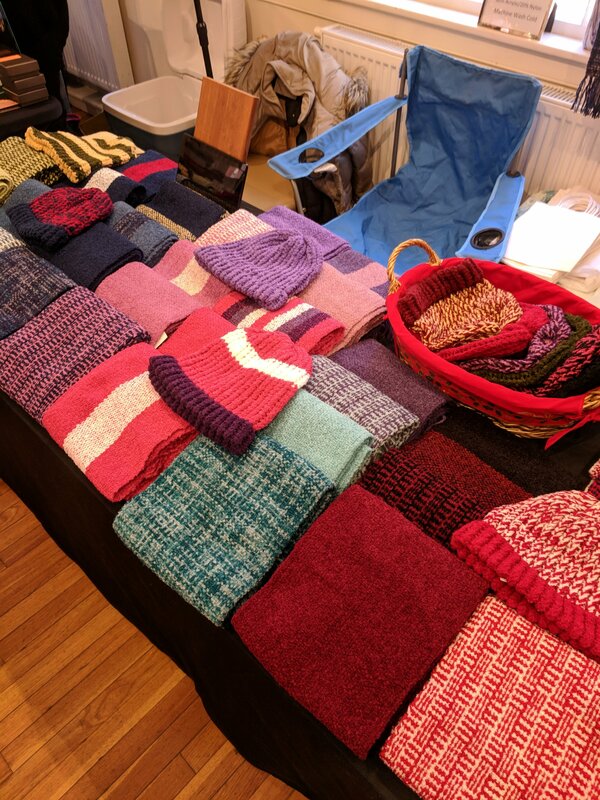 It was a cold, blustery day, which was the perfect weather for some of my customers to buy a scarf or a hat and wear it right out the door! Looking forward to a productive 2018 and growing the Weave the People Creations business! I hope everyone has a safe and healthy holiday season and New year.